Beer and food pair just as well (or better) as wine and food. Ask any craft beer fan, and you’ll be directed to a plethora of different brews that pair with specific types of food and individual dishes. However, beer and food have a much longer history than just being consumed in tandem to accent flavors and enjoyment. Beer has been used in cooking since time out of mind, and cooking, well baking, actually formed the core of many brewing concerns – the ancient Egyptians added baked bread to their brew. These days, beer isn’t used so much in cooking, at least in the US (the rest of the world still remembers how to do things right, but America’s Prohibition wiped out more than just hundreds of breweries). You might crack a bottle of your favorite brew while firing up the grill on a long summer evening, but how much do you really know about using it to cook with? Don’t worry if you’re not sure where to go or what to do. It’s not that difficult, and you’ll find that beer’s natural properties lend themselves well to myriad uses in the kitchen. You can add flavor, tang and achieve big results with your favorite craft beer. Here’s what you should know. Beer packs a lot of flavor (when you avoid mass produced big beer, and opt for the real stuff, of course) and that makes it perfect for use in marinades. It adds character and taste to your meats, but it also acts as a powerful tenderizer, thanks to its ability to break down fibers. Use your preferred brew the next time you marinate steaks, a roast, fish or chops, and you might be surprised at just how flavorful and tender the dish comes out. Basting is necessary for many different dishes, particularly large roasts, hams and birds (think your Thanksgiving turkey). It helps to add flavor to the dish, while simultaneously preventing the meat from drying out during the long cooking process. Beer is mostly water, which means that it does an excellent job of ensuring your meat retains moisture during the cooking process. It also adds color and flavor, thanks to caramelizing sugars, and the slight crispiness it imparts to meats is also a nice change of pace. Many dishes require liquid under and around the meat during cooking. For instance, you might cook a brisket, in which case you’ll need a liquid to simmer it. On the other hand, you might be poaching brats. Regardless, beer makes an excellent choice for base liquid. Add your preferred seasonings and spices, and you’re off to the races. You can even toss in other meats, such as chopped bacon or ham to ramp up the flavors added by your beer-based cooking liquid. 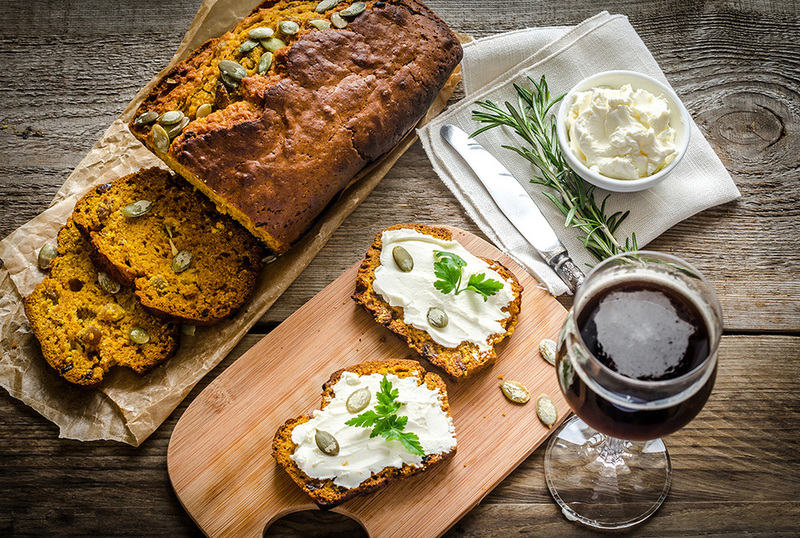 Beer has been used in the world of baking since the dawn of recorded history, several thousand years ago. Beer is essentially liquid bread, and bakers down the long centuries have used beer to replace many of the liquids used in their recipes. It makes a good replacement for both water and milk in baking, and can be used to create a range of tasty dishes, from cakes to breads to donuts. It can even be used in pancakes and waffles. The carbonation in the beer helps leaven the final product, and you’ll find a range of potential flavor options with which to experiment in your kitchen. This is probably the most common way to use beer in cooking – adding a pint or two of your favorite brew to a soup, stew or chowder can yield amazingly tasty results. Beer can be used in several different ways here. You can replace the water in your soup, or you can supplement the other ingredients as you want, depending on what you want to achieve in terms of taste. You can even use it to make a rich, hearty gravy that will add immense flavor to any dish. Of course, cooking with beer isn’t necessarily as simple as replacing one part water with one part beer. With the wide range of styles and flavors out there today, it pays to know a little bit about what works better in different roles. For instance, you wouldn’t use an IPA in the same dish as a smoked porter, and you wouldn’t want to use a Belgian white in the same capacity as an American lager. Paler beers can be used in a wider range of dishes because they’re less flavorful. Cooking intensifies the flavor of beer, so stronger beers get even stronger during the cooking process. Pale beers generally have less flavor and less complex characters, and so can be used for a wider range of dishes. Rich dishes need richer beer. While a pale beer will work for a stew, gravy or cheese dip, you really need a richer brew here. Choose a nut-brown beer or even an oatmeal stout. Porter can work too if you have more adventurous tastes. Pale beer works well in batter, and the finished dish will be both light and crispy. Darker beers can work as well, but be prepared to experiment here (of course, that’s half the fun of cooking with beer anyway). Try to cook red meat with darker beer (in terms of marinades, basting liquids or braising), but pale or wheat beer should be used with poultry or fish. If you don’t enjoy the taste of the beer out of the bottle, you’re not going to enjoy what it brings to the dish. Choose your beer wisely. Don’t overuse beer in your recipe, or it will overpower the flavor of the other ingredients. Cooking with beer is a time-honored tradition, and it’s also good fun. Why not pick up a bottle or two of your favorite craft beer and see just how much fun and flavor it can bring to your time in the kitchen?